This medium cutting polish will help significantly reduce and eliminate the appearance of swirls and scratches in the clear coat. 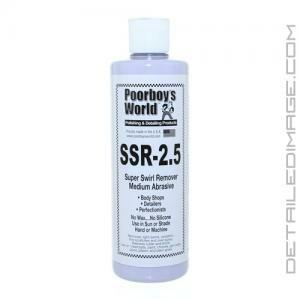 The Poorboy's World SSR 2.5 contains micro abrasives that will remove a micro thin layer of the clear coat, which buffs out imperfections in the clear coat. It also cleans the clear coat while removing oxidation to brighten the appearance of the paint significantly. This process is quite safe and it produces dramatic results that can transform paint in any condition. The SSR 2.5 should be followed up with the SSR 1 to ensure there is no hazing and the clear coat is smooth and transparent. SSR-2.5 is a professional grade mild abrasive. SSR-2.5 contains no wax or silicone. It is body shop safe, great for detailers and perfectionists, for new vehicles or old. It can safely be used on clearcoats and all paints. Use by hand or machine, in sun or shade. 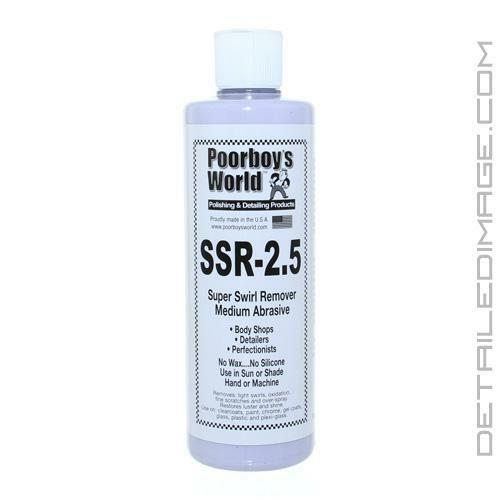 SSR-2.5 removes medium swirls, fine scratches, oxidation, and over-spray from all finishes. Its unique cleaners and mild abrasives breakdown quickly to remove marring and contaminants from the surface of the finish. As others, like the smell. Does very nice job removing swirls. Product goes a long ways. Really liked the smell. Worked very well and fpaint looked awesome. Created a lot of dust but not significantly more than other products I've used. Since 2 out of three details I have to work in sun Megs just didn't cut it on advise of others I tried SSR 2.5 and SSr 1 and it really did the job. went on very easy and allowed me to work in without all the drying problems of other polishes. Was able to wipe right off very easy. I would recommend these products very highly.